A more portable kamado, called a “mushikamado” was developed in Japan. “Mushikamado” literally means, “round clay pot” and originally had a domed clay lid. It is from these cookers that the modern kamado style grill was born. 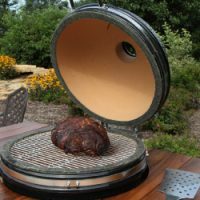 Kamado cookers developed in part because clay was readily available. From the Indian tandoor, to the Japanese mushikamado, clay stoves crossed the globe. Why? Ceramic walls retain and reflect heat more efficiently than other materials. This means even the simplest food is amazingly juicy and flavorful. The round design of the kamado grill means an even heat distribution from one end of the cooking area to the other. Even cooking, better tasting food, and precision control are hallmarks of cooking with the Saffire kamado grill. At Saffire, we combine the ancient art of kamado style cooking with the finest modern materials available. The ceramic walls of our grills are thicker. This means our grills retain and radiate heat better. Saffire is an innovator in the industry, introducing the most convenient method of adding or changing the level of wood smoke – the patented Smokin’ Chip Feeder. 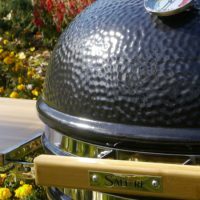 The precision control of the Saffire kamado grill offers you true wood fire flavor and more cooking versatility than a conventional grill or smoker. 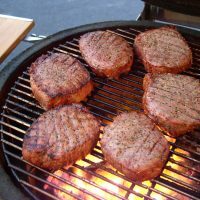 Saffire grills don’t require electricity or gas lines to operate. If you have a power outage, no problem! Explore our website today and choose the perfect kamado grill to last you a lifetime.